A social media campaign has been launched to organise a fly-past for the 75th anniversary of a US bomber crash that claimed the lives of 10 airmen. The B-17 Flying Fortress, known as Mi Amigo, crashed at Endcliffe Park, Sheffield, in 1944. The campaign began after BBC presenter Dan Walker met eyewitness Tony Foulds, who regularly tends to the memorial. He tweeted: "What a man. I'm in bits" and "Does anyone know how much a fly-past by the @rafredarrows costs?" The BBC Breakfast host said Mr Foulds was a schoolboy when he saw the plane come down on 22 February. The Mi Amigo was returning from a bombing raid. He said Mr Foulds had told him he hoped a fly-past could be organised for the 75th anniversary next month. His initial tweet has now been liked more than 4,000 times. 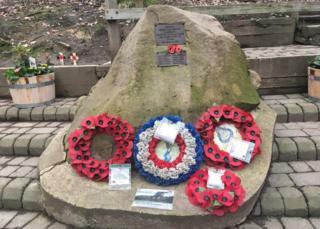 Speaking in May, after the memorial was vandalised, Mr Foulds said he owed his life to the pilot and crew of the aircraft for their efforts to avoid hitting anyone on the ground. He said: "If it had not been for them I would be dead because I was on the park when it happened."